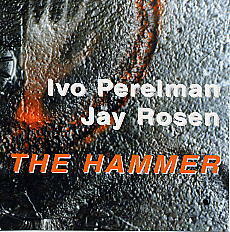 Walter Horn writes in his liner notes that, on this recording, tenor saxophonist Ivo Perelman in the company of drummer Jay Rosen, continues his deep exploration of the nether regions of improvised music: In part, because of their willingness to unlearn and re-learn the means whereby the beautiful in music may be created, Perelman and Rosen have given us a century-ending gift of extraordinary meaning. techniques created by Australian iconoclast F. Matthias Alexander. sentient note choice with no reduction in speed. overcoming habit can be very powerful. several unorthodox instruments, including Perelman's bellowing "trombivo"
carrying you away from danger on these cuts, or to be fearful of him too. The ringy result he achieves when he shuts off his snares on "Abstinence"